Everyone knows the story of Beauty and the Beast, at least they know the version told by Beauty. What about the story as seen from the Beast’s viewpoint? To Lucie, a servant girl at the Château Beaumont, Jean-Loup Christian Henri LeNoir, Chevalier de Beaumont is a nobleman par excellence—but Jean-Loup has a darker side, as many of his servants and the villagers will attest. He is self-centered and cruel as Lucie learns the night he lures her to his suite and assaults her. After that, the maidservant wants nothing but revenge. Deep in the woods of the Beaumont estate, lives Mére Sophie. Some say she’s a witch. Others that she’s merely a hermit who lost her reason and took to the wood. Whatever she is, Mére Sophie promises Jean-Loup will pay for his sins. Mére Sophie appears to him as an old woman. She asks for a cup of water, and he turns her away. The next night, a coach appears, pulled by four white horses. A noble woman seeks sanctuary from a storm. Jean-Loup is dazzled with lust. He gives the lady shelter. He wine and dines her, and then he attacks. But the lady isn’t what she seems. She’s Mére Sophie in disguise. While Lucie watches, Jean-Loup is transformed into a beast, a composite of many animals, all of them hideous. Mére Sophie gives him a single hope. Lucie transformed, also, into a candelabrum, to be Jean-Loup’s companion and his one light in the darkness of his life. The next part of the story is well-known: How a man comes to the château, is discovered by the Beast who makes him a prisoner, releasing him so he can say goodbye to his daughter; how the daughter takes her father’s place, and wins the Beast’s heart. During the years alone with the Beast, Lucie in her changed form comes to know him very well. He is very different from Jean-Loup. He’s kind and considerate, gentle and loving. By a cruel quirk of Fate, his is the true form of the master of the château. Jean-Loup is the imposter, changed from his hideous, original form by magic to a more pleasing but cruel one, then changed back through more magic. Rose’s love will re-transform the Beast into Jean-Loup, but in doing so, he will lose that which makes him truly human. Lucie now has a choice to make. Will she allow Jean-Loup to return, perhaps to break Rose’s heart as he has so many other girls? Or will she prevent him from re-emerging, and keep the Beast alive, in that ugly, terrifying form hiding a good man inside? Only a woman who truly loves a man should make such a choice. This is a most unique interpretation of an age-old and beloved fairy tale. From the Brothers Grimm version to Disney’s live action spectacle, every child is aware of the tale of how Beauty charmed the Beast, how one should never judge a person by his outer appearance but by what is in his heart. In Lisa Jensen’s story, the same is true but the outer appearance in this case, that of the handsome Jean-Loup, hides an interior as dark and hideous as any monster while the Beast’s frightening exterior houses a gentle soul seeking only to be loved. 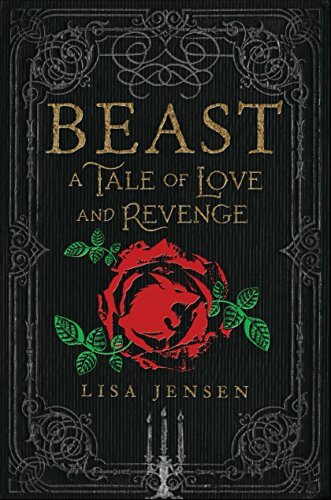 If the Beast is transformed by love, so is Lucie, going from a revenge-seeking servant girl into someone who can see the hidden qualities of others, specifically her former master. Rather than hate him, she comes to love him as he needs to be loved, and it is she, rather than Rose, who decides his final fate. This ending is definitely “Happily ever after,” but it’s not the “ever after” most people expect. Nevertheless, the contrariwise finish is assured to please and soothe the purists in the reading audience.